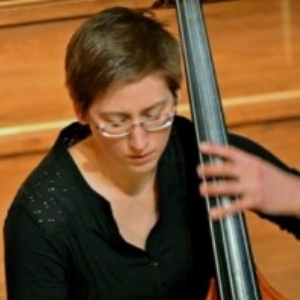 Danielle Meier is currently a member of the Omaha and Lincoln Symphonies in Nebraska, as well as Professor of Double Bass at the University of Nebraska, Omaha. A graduate of the Indiana University Jacobs School of Music, she earned her Bachelor’s and Master’s degrees in Music Performance studying with Lawrence Hurst, and was fortunate to also take lessons with Jeffery Turner, Owen Lee, and Craig Brown during that time. Originally from Delaware, Dani began studying bass at age 9 and refuses to tell you how old she is now. She grew up playing in the Wilmington Community Orchestra, moved on to the Philadelphia Youth Orchestra, played as Principal and Section in multiple orchestras at IU, and was able to attend the Brevard Music Festival and join the National Repertory Orchestra during the summer. She is also a substitute for the Cincinnati Symphony Orchestra, and will be hard-pressed to find a better Mahler 8 experience. Outside of music, Dani enjoys working with animals, specifically her own four cats, and lifting semi-heavy things.